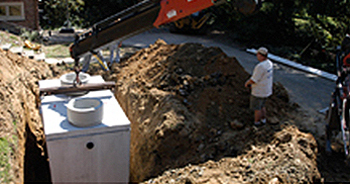 Branchburg, NJ residents and businesses in need of septic system installation can depend on Hercules Septic / Sewer Services for professional, timely and clean installation. Our trained technicians provide just the system you need, quickly and cleanly installed, and thoroughly cleaned after every service. As always, Hercules Septic / Sewer Services provides Branchburg, NJ residents and business owners with Free Estimates! Hercules installs complete systems for new construction, including alternative systems such as peat moss, infiltrator, aerator, chamber and pressure dosing systems. Tired of digging up your septic tank lid every time you have it pumped? Hercules can install a riser and locking lid that will bring the lid up to grade. We replace part or all of existing systems, and test, repair or replace septic pumps and update systems to code. We provide all required engineering and permits in compliance with state and local codes. Remove trees and shrubs from the area of the septic tank and leach field. Grass is best. Tree roots can interfere with the drainage field.